Functional Display Stands - Model Robots Nuka Cola Etc. 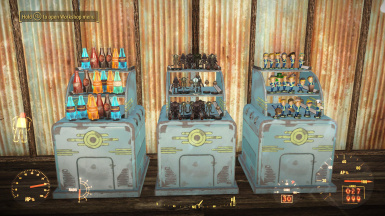 A permanent display stand for rare collectible robot models, Nuka Cola Bottles, and just about anything else!! No more lost models! THIS MOD HAS BEEN MERGED WITH FUNCTIONAL WEAPON RACKS, AND IS NOW CALLED FUNCTIONAL DISPLAYS! SEE FUNCTIONAL DISPLAYS FOR UPDATES. 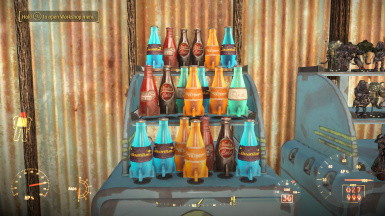 Now includes Nuka Cola Bottles!! Let me know in the comments, what collections you think should be added. So far It's Bobbleheads (vanilla obviously), Robot models, and nuka colas. Someone said holotape games. Keep in mind, these should all be things that are visually different. Eventually, I will make one generic stand for all collectible items. A stand for your rare collectible robot models! Show off your rare models that you so painstakingly searched every Vault Tech lunch box for! I hated how there was no stand to permanently display my precious robot models....so I made one! This is a container like the one for the bobbleheads. Only model robots can be added to this stand. Once they are added, they appear on the stand and cannot be moved and are not effected by collision, just like the bobblehead stand does. You don't have to worry about them disappearing when you get back home!! Also, since these models are so F***ing rare and hard to find, I decided the value of 100 caps was way too low. 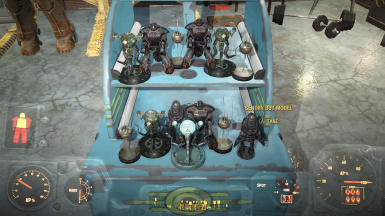 They're even more rare than the bobbleheads and those are worth 300 caps. So I raised the value to 500 caps. That way, if you do decided to sell one, you'll get what they're worth. I also made the models part of the No Junk Jet Ammo category so those rare collectibles don't get shot into someone's skull. That would definitely decrease their value, lol. Once the CK is released, I plan on making a unique texture just for the robot stand to compliment the Bobblehead stand. Don't worry, it's not game breaking, and you won't lose anything. There's a weird bug I found that I probably won't be able to fix until the CK release, that happens when you pick up your models directly from the display stand instead of from the inventory screen. It won't actually go into your inventory, but it will disappear and reappear if you open and then close the inventory. You have to take your items using either the popup inventory screen or the transfer screen. Not a bad bug, but definitely noticeable. Also, if you put more than 20 items in a stand, the top right will show all of the ones over 20 at the same time and you'll get some clipping. 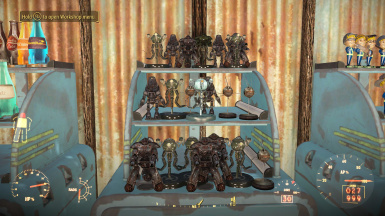 Technically, you can also use the bobblehead stand to display all of the bobbleheads, robots, and Nuka Colas at the same time. Put anything you want in there, eventually, I will make one generic stand for all collectible items. - Download from the files section using NMM. 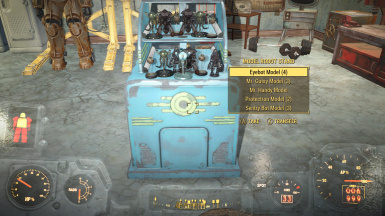 It is craftable at your settlement workshop under the same category as the bobblehead stand.